While I was preparing the story on Japans Cat man, I came across this. I couldn’t look away and wasn’t sure if it was a little creepy or LOL funny. Either way the longer I looked the more I liked it. Where else but Japan. This very realistic, like the eyes are following you realistic, giant cat head mask was on display at the Tokyo Metropolitan Art Museum. The mask is the creation of art teacher Housetu Sato and his students who sewed the Tabby Cat head out of wool felt. While I am sure there will be a few people wanting to purchase it he doesn’t have plans to sell his creation….yet. Instead his lucky students got to pose with it in these fun photos. This would be fun to wear while taking public transit? Japan is well-known for its love of cats and cat culture. They were the first to pioneer cat cafes, which have since popped up all over the world, and they even have their very own island where cats dominate and outnumber people 6 to 1. Japan also has Masahiko Suga, a 53-year-old retired electronics company worker who has become the countries first official cat man. Masahiko can been seen walking his nine cats around Kitakyushu’s central shopping district area in south-west Japan. His daily walks have earned him the name of ‘Cat Man of Kyushu”, or Cat Uncle. His little pride of well groomed cats includes Himalayan and Chinchilla Golden who are known for their laid back nature. Normally taking cats outside without being safely supervised is not something I would suggest, however from all accounts and comments by people who have actually met him the cats seems to be cozy and content. So what exactly motivates Masahiko to walk his cats? Besides not being something you would see everyday, he says “I hope society will eventually give cats the status it gives to dogs” and, in a world where our feline friends often seem to get the short end of the stick, asking for cat equality sounds pretty good to me. You can check out a short video of Masahiko on his walks or friend him on Facebook where he posts more pictures of his cats. What do you think cat equality or cat-ploitation? Whatever did people do for their daily cat fix before the invention of the internet? It’s sometimes hard to imagine there once existed other “mediums” that humans used to express their love for felines that also satisfied the instinctive needs of many to look at cats. The Life of Cats: Selections from the Hiraki Ukiyo-e exhibit, on at the Japan Society, shows us that our cat-obsession is a cross cultural phenomena dating back centuries and that Maru the cat wasn’t the first famous Japanese feline to be immortalized for all the world to see. Utagawa Kuniyoshi (1797–1861), Cats Suggested by the Fifty-three Stations of the Tōkaidō (detail), 1847. Color woodblock print; each sheet 14 5/8 x 10 inches. Courtesy Private Collection, New York. Utagawa Hiroshige (1797-1858), Cat Crossing to Eat, 1830-44. Color woodblock print; 36 7/8 x 22 3/8 inches. Courtesy Hiraki Ukiyo-e Foundation. Yoshimura Kokei (1770-1836), Dragon and Tiger, Hanging scroll, ink, color, and gold on silk; 90 x43 1/2 inches. Courtesy of Joan B. Mirviss, Ltd. New York. Utagawa Hiroshige (1797–1858), Asakusa Ricefields and Torinomachi Festival from the series One Hundred Famous Views of Edo, 1857. Color woodblock print; 22 ½ x 16 inches. Courtesy Hiraki Ukiyo-e Foundation. Various pieces will rotate during the exhibit which runs from Friday, March 13 – Sunday, June 7, 2015 at the Japan Society in New York. Fans around the world had a huge bombshell dropped on them this week, the news that Hello Kitty was not a kitty after all. As child I had my share of Hello Kitty items, including stickers and notebooks, and the reason I loved her was because she was a cat, a cute cartoon like cat. Fun, friendly with a universal appeal Hello Kitty has been immortalized in every way possible, she even has her own airline EVA Air. How many cartoon cats can say that? Her name is apparently “Kitty White, she is a Scorpio, and loves apple pie.” Of course, how did we miss that. Oh wait.. maybe it’s because we were distracted by the cat ears, whiskers and paws? So is it Goodbye Kitty? I don’t think so, to me she is and will always be a cat, and I am sure fans around the world would agree. I think we can all safely deny the silliness that Sanrio has unleashed and say Hello Kitty had a brief identity crisis before going back to her roots…or paws. One other thing, if Hello Kitty is a little girl, what does that make her friends? Would you order a pizza made and delivered by cats? Now you can thanks to Pizza Hut Japan who is putting our feline friends to work in a cute new mock video campaign called Pizza cats. Pizza Cats even have their own website and you don’t have to speak Japanese to understand the universal language that is cat. Of course it’s not real, but we can dream can’t we? The videos highlight how a Pizza Hut would run if cats were at the helm and as you can imagine getting your pizza delivered on time might not happen. Watch employees cats hard at work at the local Pizza Hut here, and sorry they don’t deliver to North America. There are lots of things that people look for in a new place to live whether it’s location, a great kitchen or maybe a cool outdoor space, but what do cat lovers look for? 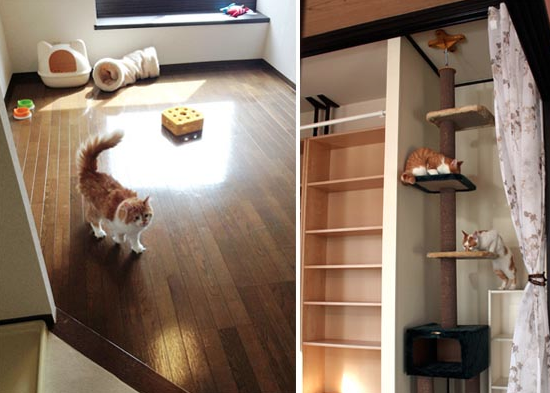 If you live in Tokyo you can easily combine apartment hunting with cat adoption – new apartment new cat. Tokyo Cat Guardian (TCG) introduced a partnership with specific landlords to include a “free cat” with a new apartment. The goal is to help get Tokyo’s huge number of homeless cats get off the street, reduce the large euthanasia rates (something like 222,000 cats are killed a year), pair cat lovers with a furry new friend and encourage adoption. The idea is to make condominium and apartment living more enticing by adding a feline companion to the list of amenities. So far the Cat Mansion Program has been well received and is growing with 20 plus properties joining up to be part of the initiative. TCG takes the process very seriously and ensures that new applicants are carefully screened prior to adopting a cat from one of the organizations shelters, but once applicants are approved they take their new cat home. The tenant is responsible for paying for the cat food and any vet bills during their stay in the rental and if and when they move, they can decide whether to adopt the cat permanently or return the kitty to the TCG shelter. Importantly the organization provides support to adopters with information sessions on how to properly care for their new companions. The founder of the idea, and member of TCG Yoko Yamamoto, goes one step further by making herself available to new cat parents 24 hours a day, 365 days a year to assist them with any questions they may have about their cats.